I've written over 400 posts on this blog since it started about two and half years ago. I'm really proud of this blog too. But clearly, something is going on that's preventing me from writing as much as I used to. I hate it. The same ideas are not flowing through me anymore and I've really been asking myself, "well, why?". I used to fluff the question off assuming that I've simply run out of ideas. The more I think about it though I know that's only a half truth. My best guess is that I feel less connected to Erik's career. It even feels hard to write that. But it's true. Erik worked for Jean-Georges since he started as a cook, still in culinary school. Jean-Georges was the front runner above all over fine dining chefs and restauratuers in my mind. I idolized him. And why not? I watched as my husband quickly fell in love with a career and lifestyle through the school of Jean-Georges. As Erik was training and learning I was reading the same blogs that all the industry people and foodies do-belonging to neither group. I was going along for the ride and loving every minute of it. I labeled myself first not as a friend, wife, or woman, but as a chef's wife.I even considered making the label permanent with a chefwife tattoo. I don't even like tattoos. When the Bragard uniform catalogue came in the mail I would quickly turn to the page of Jean-George and sigh in gratitude that he was taking care of us-mind it in a far distant way. Things are different now. Not only does Erik work for a new company, in a new position but I've become less connected to what he's doing. I still turn through the Bragard catalogue to see Laurent Tourondel there, but it's not the same. I just don't ask about employee drama anymore, I've stopped reading the blogs altogether, and I see myself now as a unique person first, chefwife, friend and sister later. I do also have to say that when Erik joined BLT it was 24 hours before I knew I was pregnant so I'm sure that has something to do with it too. I am still completely 100% supportive of my husband-just not wrapped up and overwhelmed in his work. Before he travels I get all of the hotel information for him such as: do they have a gym...laundry service...shuttle to the airport...shuttle to the restaurant...? Really though, that's also for me to have a little peace of mind. I eat at the BLT restaurants and ask lots of questions about this new restaurant group. I still stand tall when people ask, "What does your husband do?". 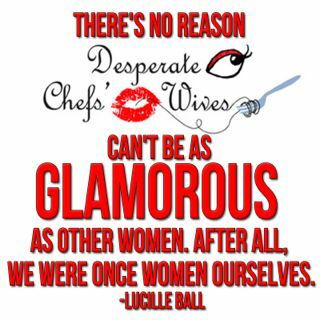 What does all of this mean for the Desperate Chefs' Wives? I am still completely committed to the connections I've made with other wives and girlfriends. I would love for the blog to last forever, but I am struggling to write since it's not on the forefront of my mind anymore. And now that I've been direct with you-what will you think of me? I went through the same thing with my blog this past summer. Do what's right for you. You'll figure it out. Maybe you could start a new blog, for example related to pregnancy. There are different stages in life and now you begin a new one. So you have new ideas and different emotions to share with people. I noticed this change too once my chef husband and I had our baby. I had more time before the baby to meet him after work or at least stay up to talk with him when he got home. I knew what his specials where, I listened at length about menu changes and staff drama. With a newborn we hardly ever saw each other and when we did we had more important things to discuss like what the baby ate for the day or how long his naps where. (We worked a split schedule to minimize babies time in daycare). I've noticed now that our son is older (18mo) and sleeping through the nights, I've had a desire to reconnect with who I was before baby. We are planning more date nights, overnights to grandmas for the little guy and we are less sleep deprived and able to talk about both our jobs again. Looking back, it just reminds me how fluid and ever changing life is. So take the time to enjoy where you are at right now. I think guest Bloggers is a great Idea!! I just found you ladies and I'm new to the Chefwife world. I would hate to see this site fade away!!! 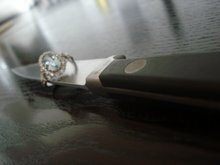 If I may be so bold....I'm in the process of creating an online support system for Significant others in the Restaurant Industry..(http://marriedtoachef.com/) It's not UP yet..Because what you're going thru is Typical. 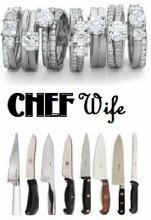 YOU are who you are...and just ONE part if being a Chefs Wife...Married to one but I think we can't fully understand what being in and working for the industry truly meansBut WE need support too.. It takes a strong woman (or man) to really live a STRONG relationship with someone in this industry...It is my intention for the website to be a place, a haven for people to come and commiserate our frustrations.. a place to connect and to help facilitate connection.. by Christmas the Front Page should be up... by Spring the site should officially launch. Maybe we can work together.. ALL of you can help this be the place to come to.. to support and be supported... in the meantime.. You are NOT alone.. What you are feeling is definitely part of the process!!! Congratulations on your expecting arrival!!!! Thanks for the well wishes Kerilyn and good luck with your site. From starting this site the main thing I've learned is that I'm not alone. And although it helps to feel the support of other women, the frustrations feel just as bad. Typical or not-no one likes feeling the negative feelings associated with being married to a workaholic. Believe me as soon as bebe is born and you're home alone waiting for said "chef" to come home and youre holding crying bebe, unshowered and tired...you will have lots to write about! PS Tiger Lily - I love you for that shower! Yes, a shower can be a wonderful thing! We do need to stick together and help eachother. Being a chef wive is one thing, but being a mother when your husband is a chef is a whole other animal! Hilary, trust us when we sy that soon you will have so much going on you won't really care what shuttle he takes or who he's cooking dinner for...you'll be raising a HUMAN BEING!!! It's awesome...you will love it and it will feel amazing, almost liberating not to be attached to his career so much. I guess the change comes when you go from having him and his career be the center of your relationship to then YOU being the center, because you're the mother, the protector, the nuturer, the core of your family!